The U.S. attack on a Syrian air base came after years of heated debate and deliberation in Washington over intervention in the bloody civil war. Chemical weapons have killed hundreds of people since the start of the conflict, with the U.N. blaming three attacks on the Syrian government and a fourth on the Islamic State group. One of the worst yet came Tuesday in rebel-held northern Idlib and killed dozens, including women and children. That attack prompted President Donald Trump, on day 77 of his presidency, to dramatically shift U.S. policy, with the first direct U.S. attack on the Syrian government. Trump blamed Syrian President Bashar Assad for the attack and called on the international community to join him in trying to end the bloodshed. March 2011: Protests erupt in the city of Daraa over security forces’ detention of a group of boys accused of painting anti-government graffiti on the walls of their school. On March 15, a protest is held in Damascus’ Old City. On March 18, security forces open fire on a protest in Daraa, killing four people in what activists regard as the first deaths of the uprising. Demonstrations spread, as does the crackdown by President Bashar Assad’s forces. April 2011: Security forces raid a sit-in in Syria’s third-largest city, Homs, where thousands of people tried to create the mood of Cairo’s Tahrir Square, the epicenter of protests against Egypt’s autocrat Hosni Mubarak. Aug. 18, 2011: President Barack Obama calls on Assad to resign and orders Syrian government assets frozen. Summer 2012: Fighting spreads to Aleppo, Syria’s largest city and its former commercial capital. March 19, 2013: The Syrian government and opposition trade accusations over a gas attack that killed some 26 people, including more than a dozen government soldiers, in the town of Khan al-Assal in northern Syria. A U.N. investigation later finds that sarin nerve gas was used, but does not identify a culprit. Aug. 21, 2013: Hundreds of people suffocate in rebel-held suburbs of the Syrian capital, with many suffering from convulsions, pinpoint pupils, and foaming at the mouth. U.N. investigators visit the sites and determine that ground-to-ground missiles loaded with sarin were fired on civilian areas while residents slept. The U.S. and others blame the Syrian government, the only party to the conflict known to have sarin gas. Aug. 31, 2013: Obama says he will go to Congress for authorization to carry out punitive strikes against the Syrian government, but appears to lack the necessary support in the legislature. Sept. 27, 2013: The U.N. Security Council orders Syria to account for and destroy its chemical weapons stockpile, following a surprise agreement between Washington and Moscow, averting U.S. strikes. The Security Council threatens to authorize the use of force in the event of non-compliance. Oct. 14, 2013: Syria becomes a signatory to the Chemical Weapons Convention, prohibiting it from producing, stockpiling or using chemical weapons. June 23, 2014: The Organization for the Prohibition of Chemical Weapons says it has removed the last of the Syrian government’s chemical weapons. Syrian opposition officials maintain that the government’s stocks were not fully accounted for, and that it retained supplies. Sept. 23, 2014: The U.S. launches airstrikes on Islamic State group targets in Syria. Aug. 7, 2015: The U.N. Security Council authorizes the OPCW and U.N. investigators to probe reports of chemical weapons use in Syria, as reports circulate of repeated chlorine gas attacks by government forces against civilians in opposition-held areas. Chlorine gas, though not as toxic as nerve agents, can be classified as a chemical weapon depending on its use. Aug. 24, 2016: The joint OPCW-U.N. panel determines the Syrian government twice used helicopters to deploy chlorine gas against its opponents, in civilian areas in the northern Idlib province. A later report holds the government responsible for a third attack. The attacks occurred in 2014 and 2015. The panel also finds that the Islamic State group used mustard gas. Feb. 28, 2017: Russia, a stalwart ally of the Syrian government, and China veto a U.N. Security Council resolution authorizing sanctions against the Syrian government for chemical weapons use. April 4, 2017: At least 58 people are killed in what doctors say could be a nerve gas attack on the town of Khan Sheikhoun in the rebel-held Idlib province. Victims show signs of suffocation, convulsions, foaming at the mouth and pupil constriction. Witnesses say the attack was carried out by either Russian or Syrian Sukhoi jets. Moscow and Damascus deny responsibility. April 5, 2017: Trump says Assad’s government has “crossed a lot of lines” with the suspected chemical attack in Syria. April 6, 2017: The U.S. fired a barrage of cruise missiles into Syria Thursday night in retaliation for this week’s gruesome chemical weapons attack against civilians, U.S. officials said. It was the first direct American assault on the Syrian government and Trump’s most dramatic military order since becoming president. Trump said strike on Syria in the “vital national security interest” of the United States. 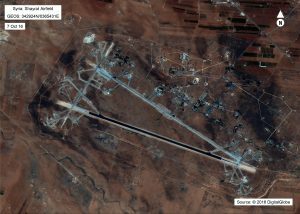 Left: The Shayrat airfield in Syria is shown in this satellite image, revealing damage from a barrage of U.S. cruise missiles late Thursday evening. Photo provided by the U.S. Department of Defense.